Hi. These next few days in New York are going to be a madhouse. I’m sorry. He arrives Thursday evening. Stay away from St. Patrick’s Cathedral. Friday morning, stay away from the U.N. The pope will be addressing the U.N. for its 70th anniversary, but you wouldn’t want to be near that kind of history making. Later that day he will be holding services at the 9/11 memorial. There’s no way you’ll be able to leave for lunch or Seamless. Must. Bring. Lunch. UGH he’s in East Harlem at 4:00 p.m. WE JUST CAN’T ESCAPE. Then he’s in Central Park, just parading around. Don’t be anywhere near Madison Square Garden at 6:00 p.m.
He’s finally leaving on Saturday morning. Here are the streets you need to avoid as told by DNA Info. Very important to know. I recommend staying in your house until after Beyoncé’s concert on Saturday. Only then will the streets be safe again. ► 50th Street from Fifth Avenue to Sixth Avenue, and will remain closed until 9 p.m.
► 51st Street from Fifth Avenue to Sixth Avenue, and will remain closed until 9 p.m.
Beginning at 6 a.m. the following streets will be reopened until 10 a.m.
Beginning at roughly 10 a.m. the following streets will be closed to vehicular traffic until 9 p.m.
Beginning at roughly 2 p.m. the following streets will be closed until approximately 9 p.m.
Beginning at 8 a.m. the following streets near the Papal Nuncio’s residence will be closed to vehicular traffic until Saturday, Sept. 26 at roughly 10 a.m.
Beginning at roughly 3 p.m. the following street near the Papal Nuncio’s residence will be closed to vehicular traffic until Saturday, Sept. 26. 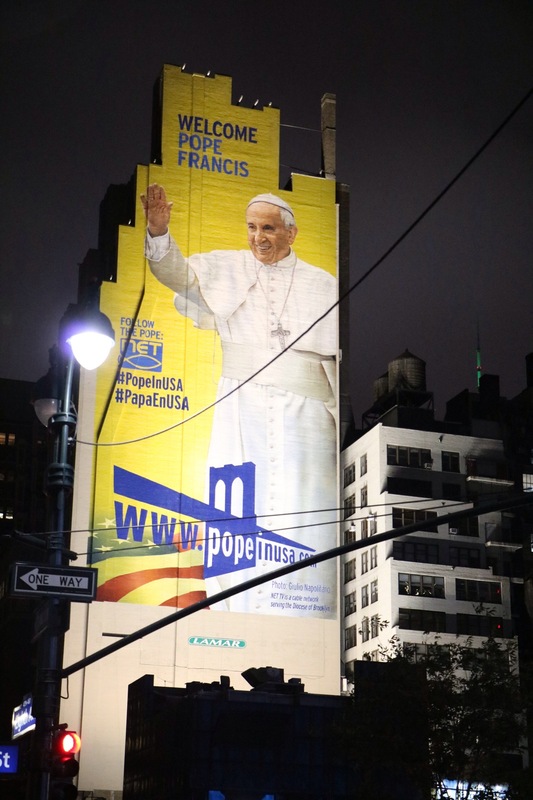 ► Madison Avenue from 69th Street to 74th Street while the Pope is in residence. Beginning at approximately 10 p.m. the following streets near the Papal Nuncio’s residence will be closed to vehicular traffic until 6 a.m.
► Madison Avenue from 69th Street to 74th Street. ► First Avenue from 42nd Street to 48th Street. The tunnel underpass from 41st Street to 48th Street will remain open for passenger cars. Trucks and other large vehicles will not have access until the end of the day’s session. ► Southbound on West Street from Chambers Street to Albany Street. Additional street closings may occur, according to the NYPD. Next M.I.M Giveaway! See a Very New York Drag Show FO’ FREE!